This is an anchor chart created with a middle school class. It works well for any grade, but particularly fifth grade through high school. 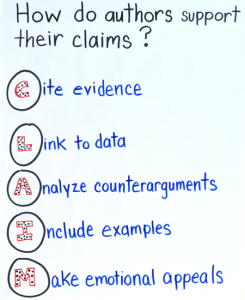 This is most appropriate because those grade levels will use the term claim through their writing and reading standards much more frequently. These grade levels focus on the idea of a claim much more intensively an frequently. 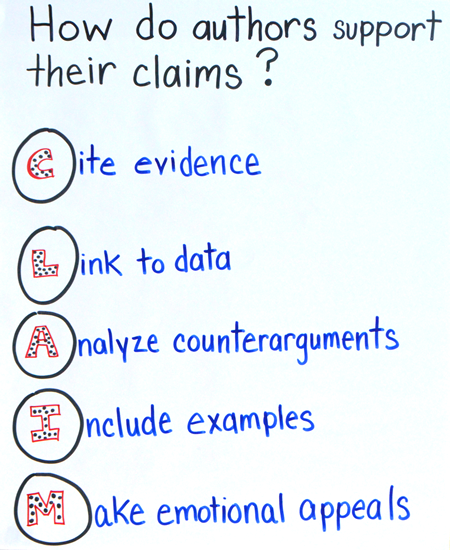 Often multiple other standards depend on the assumption that students in these grades recognize claims and can move on to evaluate the validity and strength of the multiple claims. I created this entire chart with students. For a more polished chart, create the circle and the letters in advance or use bulletin board letters in matching fonts and colors to spell out claim. Spend time explaining what each example means. Show students a paragraph or text that cites evidence, makes and emotional appeal, includes examples, etc. You also want to discuss which ways may overlap, which ones are stronger, and even spend time discussing which ways are most appropriate to support different types of claims. Some teachers that have created this chart have introduced one or two letters at a time. You can go out of order and just focus on the types that students are specifically encountering in the text. Leave the other letters blank until you introduce it through authentic text examples. Challenge students to emulate the type of support by writing their own. Consider giving them a writing prompt or argument and asking them to craft one or two types of support for the argument. They don’t need to write an essay or even a paragraph. They just need to show that they understand what that type of support might look like. Use fun topics that students will have a connection to. I just wanted to say thanks for creating this site! You have really helped me transform my teaching. I have become an anchor chart advocate and my kids are eating it up. I used to think that these charts were just for very young children, but they are so very effective with my eighth graders that I regret not using them earlier! Hi, I really enjoy your posts. I have ordered ALL five of your books and follow you on Pinterest. Keep coming up with awesome ideas and strategies! !